Want to reconnect with what truly makes you happiest? Rediscover the playful and fun-loving you. Take stock of all you have to be grateful for, rekindle the joy in your work and relationships. We created the mid-year Joyful You Retreat to reconnect and re-energise you and your goals so that you can finish the second half of the year strong. It’s a great opportunity to reflect on the recent past, look forward to your next 6 months and come up with some solid plans to move towards reaching your personal and/or professional goals. You’ll walk away with renewed joy and energy, and a stretching yet achievable plan. 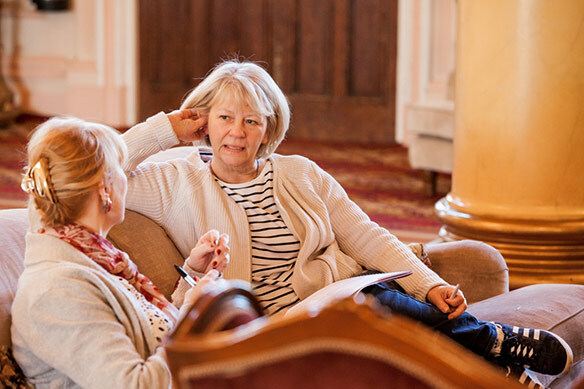 If your organisation is interested in finding out more about our retreats for one or a group of your leaders please get in touch to discuss the needs and requirements of your senior leaders and your organisation. For group bookings, we will put together a tailored retreat package to meet your requirements. When we are centred in joy, we attain our wisdom. Time out to move out of overwhelm, to refresh, reflect and re-imagine your life. A clear, achievable plan for your year ahead that looks at your personal as well as professional life. 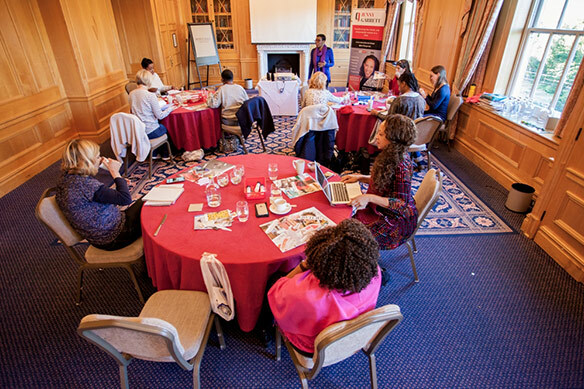 A network of like-minded, supportive working women to help you. A reconnection with your authentic self. A feeling of being renewed, revived and supported. A deep sense of taking back control. Why a retreat and not a workshop? Being in the same old environment creates the same thinking and the same results, taking yourself out of that creates the opportunity for new thinking, for creativity and to unlock your deep knowing. Taking time out isn’t selfish, it means that you will be able to be more present, energetic and be a nicer person to be around in the long term. According to the Chopra Centre Research – It can be difficult for people to break away from their lives for more than a few days but the longer you can spend away at a retreat, the more likely you are to keep up your new practices when you get back. To get the most out of the retreat, we believe it’s important to be in beautiful and inspiring surroundings. Being in the same old environment creates the same thinking and the same results, taking yourself out of that creates the opportunity for new thinking, for creativity and to unlock your deep knowing. We have chosen Down Hall Country House Hotel, because it’s surrounded by enchanting grounds, with aged trees, secret gardens and lush greenery – the perfect space for reflection. The hotel facilities and grounds are the perfect place to focus, relax and re-discover yourself with like-minded people. The food and drinks are truly scrumptious, meals that don’t just dance beautifully on the tongue but are a feast for the eyes as well. Space is designed into the weekend to relax and recharge, whether that be over delicious meals or meditative walks through the grounds. Precious time without the usual demands of life means that women can prioritise themselves for a change, which was is really appreciated and much needed. Actually taking some time out to reflect on your life and work and plan for the future. Being surrounded by like-minded women who understand that when you succeed they succeed too. Having the space for self-reflection and creative thinking. Walking in nature and making new connections. Attending workshops wholly focused on moving you forward. We begin with a powerful visualisation connecting you with your inner compass and then guiding you to consider the rooms you spend time in and the ones that you don’t, why that is and how you want it to change. This experiential session, facilitated by Coach Jackee Holder, will explore the relationship between your inner and outer nature. Drawing from the nature on your doorstep and the wonderful trees on the retreat grounds, you will set off with a series of writing prompts designed to explore your own relationship with nature and the connections with your own interior. Consider this a short adventure into the wild nature of who you are. Grab this opportunity to have a date with yourself. You can explore the sumptuous grounds in a meditative walk, curl up in a corner on a comfy sofa and reflect, or take the opportunity to use the spa. You will be provided with some tools to guide your reflection and make the most of this time of this important ‘me’ time. Coach Andrea Watts will help you use images in collage to unlock your unconscious, overcome challenges and release your potential. Lastly, Coach Jenny Garrett will move you effortlessly to setting your new intentions, on how you will intentionally visit your four rooms – Spiritual, Physical, Mental and Emotional – daily. You will make a commitment to yourself and others, anticipating what you will need to keep yourself on track; such as the accountability groups and online support you desire to stay intentional in daily life. 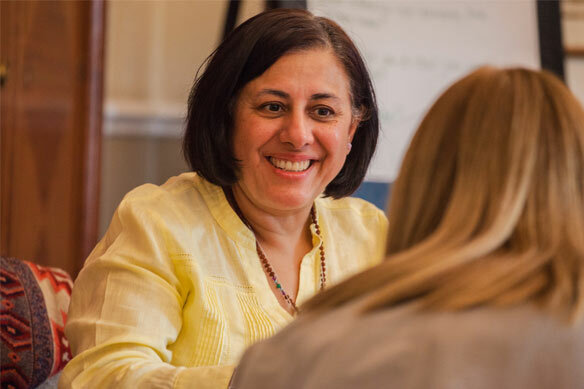 Jenny works with individuals and organisations, using her experience in coaching and leadership development to inspire and motivate, empowering people to reach their full potential and achieve career and life changing results beyond expectation. She is passionate about empowering people, teams and organisations to be the best they can be, challenging leaders to make a positive difference and inspiring inclusive and authentic leadership. Jenny has written an Amazon Bestselling Book ‘Rocking Your Role’, on the taboo subject of female breadwinners. Jenny gives back through her social enterprise Rocking Ur Teens. Your vision will become clear only when you look into your heart. Who looks outside, dreams. Who looks inside awakens. Special offer: Book by 14th April to benefit from a discounted price of £749 (Usual price: £899). Price: £749.00 when you book by 14th April, this is based on two people sharing a room. If you would prefer a single room, there is a £100 supplement. Secure your place today with a deposit of just £250.00, followed by 2 payments of £249.50. Full payment must be received by the end of April 2019. 10% of all profit will be donated to social enterprise Rocking Ur Teens CIC. A social enterprise dedicated to inspiring, increasing aspirations and making social change happen. Buying the Happenista Retreat as a gift? Let us know and we will send your ticket and information presented in a lovely luxury gift box. 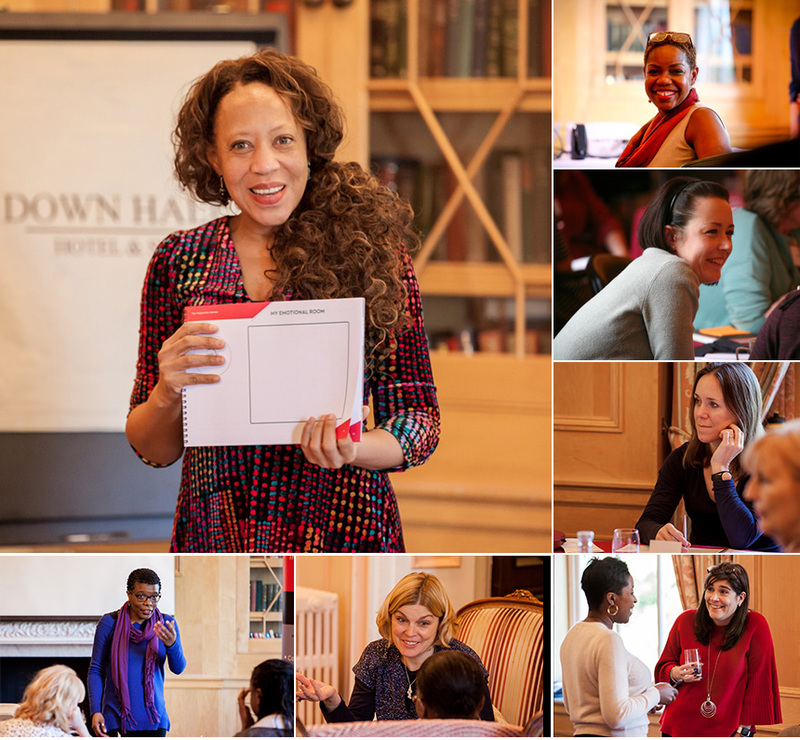 I have attended the Happenista retreat a number of times and would seriously recommend the programme to anyone finding themselves at a cross roads, personally or in their career. From the outset Jenny gives us a clear vision of how the days will be. Her exceptional understanding and her commitment to each individual is outstanding. Each time I have attended I have left with a sense of purpose, a reviewed vigour to implement positive change but most importantly a calmness of mind. I believe we use the word love to frequently these days but I can genuinely say “I love the spirit” of these retreats. Jenny’s vision to “transform the world for all, one economically empowered woman at a time” is truly inspirational. I have transformed my thoughts into positive intentions and then into actions. My journey has been impactful and challenging at times but so worth it. A massive thank you to Jenny, her team and all the women I have met through the Happenista programme. I am a better woman thanks to you all. Sunday breakfast, refreshments and lunch. We find that participants enjoy sharing and it’s an additional way to make connections and develop friendships. Can I come for just part of a retreat? For the benefit of everyone, we ask that all participants commit to attending the entire retreat, arriving for the beginning of the retreat and staying until the end. Your wholehearted commitment supports your fellow participants and expresses respect for the retreat facilitators and staff who are committed to being here. Can I stay extra days, before or after the retreat? Classic rooms are spacious and comfortable, complete with working desk, in-room iron and ironing board, tea & coffee making facilities and complimentary wifi access. All classic rooms are situated in the historic main house building and have stair access only.’ To keep the retreat affordable, prices are based on 2 sharing a twin room. What should I wear, and what should I bring with me? What I should wear? Please dress comfortably, indoor shoes and good outdoor shoes, boots or wellingtons for walking. Warm clothes are advisable for the walk and an umbrella. You may want to change for dinner and bring a swimming costume if you wish to use the spa. What should I bring with me? Remember to bring any food supplements or medication you regularly take – enough for the length of your stay. Are there opportunities or space for other activities? Sunday morning before 11am would be a great opportunity to visit the spa and enjoy the grounds. Use of the spa is free, however there is an additional charge for treatments. Please book directly with down hall hotel for treatments. An additional opportunity would be when the retreat finishes at 3pm on the Sunday. All bookings are provisional until confirmed by our admin team. Please do not make any travel arrangements until after you receive confirmation of your booking. We cannot be held liable for travel costs. about your dates and retreat costs before you book. date, the cancellation fee will be £100. date will incur the loss of the full cost of the retreat. to 5 working days to be processed. If you have to cancel your retreat due to adverse weather conditions our standard cancellation policy (above) still applies. The Happenista retreat is a place for you to nurture yourself. I have attended three retreats and left feeling inspired and full of hope. As a Counsellor, Social worker and mother of two teenage boys, self care is imperative. You will have so much fun and make new connections and friendships. I set a few Intentions which have now manifested. Having struggled with procrastination, self confidence and self belief, the support I received helped me to believe I can do it. This was the beginning of my company ‘The Road Ahead’. This week I received my first private client Thanks Jenny and all of the Happenistas for your support. Special Offer: Book by 14th April to benefit from a discounted price of £749 (Usual price £899).